Say Bolt Viscometer Description:Se-Test India Pvt. Ltd., is an eminence of say bolt viscometer manufacturers and supplier. The Skilled team is well equipped with latest technics and designs say bolt viscometer according to the indulgent market needs at the much-advanced stage, which helps to create the products which are as per the necessity of the market. Se-Test India Pvt. Ltd. Saybolt Viscometer (Model No. 1308) compliant to ASTM D88, D244, and AASHTO T72 industries standards is used to empirically measure the fluid viscosity of petroleum products. The Saybolt Viscometer controls the fluid's heat and viscosity between the temperature range o 70OF and 210OF. 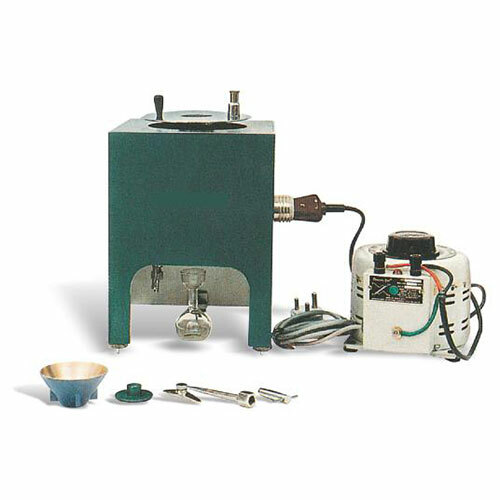 It can also be used to determine the Saybolt Furol Viscosity of the bituminous materials at different temperatures ranging from 250F to 450F. Comes with Cylindrical Oil Cup. A Bath Fitted that is fitted with immersion Heater mounted on a stand. To Control temperature a Dimmer stat. A Stirrer with a shield. An insulated handle and thermometer support for the receiving flask, filter funnel, withdrawal tube, cup and circular spirit level. A Heating Coil. Voltage: 250 V 50 Hz A.C. with a single phase.